Esco | Thank you for visiting us during the Arab Lab 2018! Thank you for visiting us during the Arab Lab 2018! 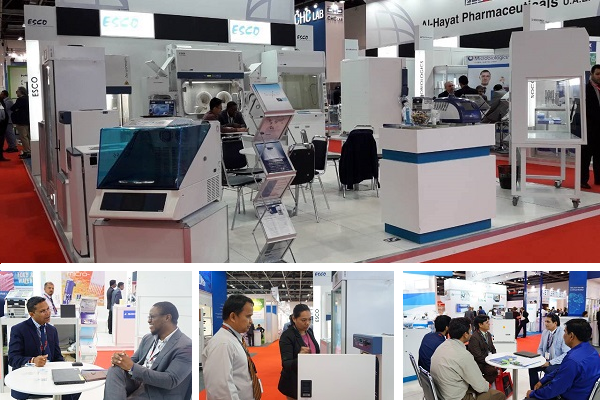 Arab Lab, considered as one of the most influential annnual exhibits for the global healthcare, laboratory, medical, analytical and scientific industry, was successfully held at the Sheikh Saeed Halls, World Trade Centre Arena in Dubai, UAE. This event, held March 18-21, showcases various scientific equipment from companies worldwide. Esco Group, once again, took part in this annual show, displaying an array of topnotch Life Sciences and Pharma Containment Technologies. The units displayed at the booth includes Airstream® Laminar Flow Cabinet, CelCulture® CO2 Incubator, Frontier® Acela Fume Hood, Isoclean® Healthcare Pharmacy Isolator, Airstream® Biological Safety Cabinet, Isotherm® Laboratory Oven, Lexicon® Ultra Low Temperature Freezer, Versati™ Laboratory Centrifuge, Aeris™ and Swift™ Thermal Cyclers, HP Series Lab Refrigerator and OrbiCult™ Lab Shakers. Over a hundred visitors, that includes company presidents, regional managers, directors, laboratory consultants, engineers, sales managers, and distributors from all over the world, came to visit Esco’s booth with much delight and expressed interest over our products. Truly, this 4-day event has been a great platform to meet more clients, make one’s brand known, and be connected to professionals across the globe. See you again next Arab Lab!